Researchers from the American Association for Cancer Research (AACR) announced yesterday, the discovery of two molecules that could be helpful in predicting cancer metastasis on patients with breast cancer. A cancer-metastasis prognostic tool would be of great value, as most deaths in breast cancer cases come as a result of metastatic tumors. According to Kounosuke Watabe, one of the study's chief authors, recently published literature indicates that various microRNA molecules have a crucial role in the metastatic process. The researchers performed microRNA profile analysis on RNA, extracted from human breast cancer stem cells, which were taken from a cultured cancer cell line. They discovered that when the expression of mir-7 in cancer stem cells was increased, their metastatic capacity was decreased. They then studied the mir-7 downstream molecular pathway to discover its targets and found out that the molecule suppresses the expression of the KLF4 gene. 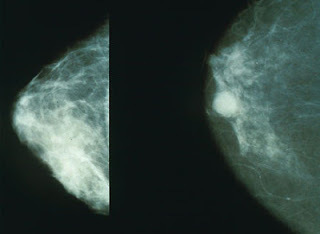 Mammogram showing a healthy breast (left) and a cancerous breast (right). Further experiments on an animal model showed that miR-7 expression significantly reduces brain metastasis, without however affecting bone metastasis. The researchers finally took cancer samples from patients with breast cancer that had metastasised to the brain, in order to confirm their previous findings. The observations made, were once again similar. Mir-7 function was reduced whereas KLF4 function was increased. Watabe says that cancer stem cells use the brain as a "sanctuary". There, they find protection from most chemo-drugs as very few of them can pass the blood-brain barrier. “It is possible that miR-7 and KLF4 may serve as diagnostic or prognostic markers, or therapeutic targets for the prediction of, or treatment of, brain metastasis” he concluded. Breast cancer is a type of cancer starting in the tissues of the breasts. It accounts for about 23 % of all cancer cases in women, causing more than 400.000 deaths world wide each and every year. It mainly affects women who are more than 100 times prone to it.